A lighthouse was proposed in 1896 to mark Pecks Ledge, at the east end of the Norwalk Islands, as Norwalk was becoming an increasingly important commercial port. _A lighthouse was built at nearby Greens Ledge by 1902, but it wasn't until 1906 that the light was operational at Pecks Ledge. It was the last staffed lighthouse to be built at a waveswept site on Long Island Sound. Its life as a staffed light was relatively short -- only 27 years. In 1901, $10,000 had been appropriated for a smaller structure, but when it was decided that Pecks Ledge Light would include accomodations for two keepers, an additional $29,000 had to be appropriated before construction could begin in the summer of 1905. Pecks Ledge Light is a typical offshore light of the late nineteenth - early twentieth century period: a sunken cylindrical cast-iron foundation, filled with concrete, topped by a "sparkplug" type cast-iron lighthouse made of curved cast iron plates, bolted together, with a brick lining. The lantern was initially fitted with a fourth-order Fresnel lens exhibiting a flashing white light. The interior has three stories of living space, topped by a watchroom and lantern. There was also a basement containing cisterns for the storage of rainwater. George W. Bardwell was the first keeper at a salary of $600 per year. In February 1913, Keeper Conrad Hawk was working on his lobster traps and left some tar near the kitchen stove. _He then noticed that the nearby lantern at Grassy Hummock was out and rowed over to relight the navigational aid. On his way back to Pecks Ledge he saw smoke pouring from the tower's windows. Thinking quickly, Keeper Hawk climbed to the tower roof and managed to get inside the lighthouse. He blocked a kitchen window with a quilt, stopping the draft that was feeding the fire. He then repeatedly drew seawater with a bucket and managed to put out the flames. Although his carelessness caused the fire, the keeper's fast thinking may have saved the lighthouse from destruction. In December 1921, the steam vessel J.C. Austin developed a leak near Greens Ledge. The four crewmen escaped to a lifeboat -- with no oars. Keeper Charles Kenny at Pecks Ledge saw the helpless men. Kenny and the assistant keeper rowed through five-foot swells, picked up the Austin's crew and brought them safely to the lighthouse. 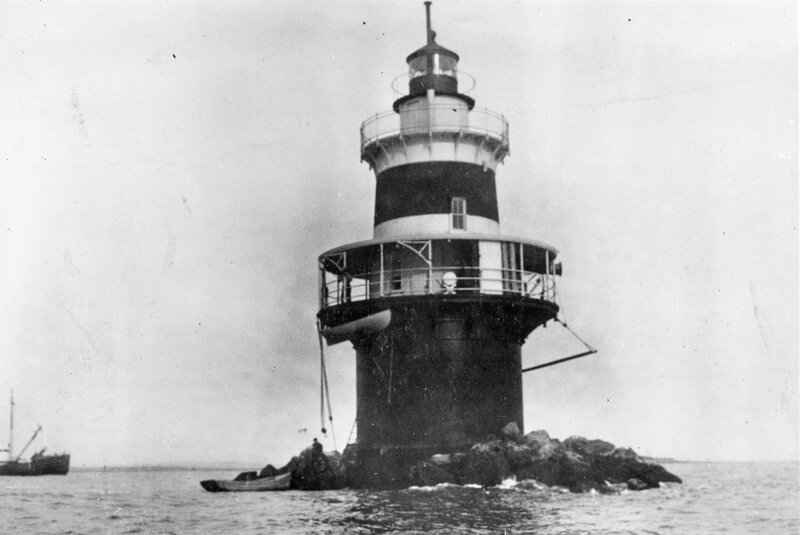 In 1933, the light at Pecks Ledge was automated against the wishes of Norwalk area mariners, but Coast Guardsmen kept watch at the lighthouse during World War II.. The original lens was removed in 1939. The lighthouse remains an active aid to navigation with a flashing green light. Pecks Ledge Light, painted white with a brown band in the middle, has suffered from vandalism, nesting birds, and corrosion. It can be seen distantly from shore at Calf Pasture Beach. Under the provisions of the National Historic Lighthouse Preservation Act of 2000, Pecks Ledge Light was sold via online auction in September 2015 for a high bid of $235,000. The owner is Lighthouse Preservation Group LLC, based in Delaware.